The guru system we have today in ISKCON is the result of a “guru reform” movement spearheaded in 1984 by His Grace Ravindra Svarupa Das (RSD). 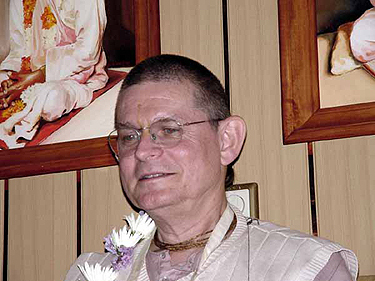 This “reform movement” sought to convince the world that, though ISKCON’s GBC (Governing Body Commission) had made a huge error in unauthorisedly appointing 11 “pure devotee guru successors” to the real Guru, Srila Prabhupada, they had now become “enlightened” with the actual truth; namely, that Srila Prabhupada had left an open field for any of his disciples to succeed him as a diksa (initiating) guru - so long as the GBC gave its voting approval, which has resulted today in some 70 unauthorised gurus. We will now analyse the words and wisdom of the founder of ISKCON’s current guru system, who expanded the hoax from “11 to 70”. Here RSD tries to blame the mess which ISKCON is in, on the spiritual master of Srila Prabhupada, Bhaktisiddhanta Sarasvati Thakur! Here RSD compares the management style of both Srila Prabhupada and the zonal acharya system (Great Guru Hoax part 1) to that of the Mafia. Here RSD offensively tries to demonstrate the alleged fallacy of the ritvik viewpoint by highlighting Srila Prabhupada’s physical absence. So on the one hand 11 ritviks were appointed to go on to become gurus, and on the other they were simultaneously selected and not selected to be gurus. Here we see how the so-called “guru reform” deal was “stitched-up”. The “guru reform” led by RSD from 1984 had to find the solution to what went wrong with the horrendous zonal acharya system in place at the time (Great Guru Hoax part 1). Very quickly, he finds the answer – to make sure he gets a share of the guru pie himself. And WHO gives it to him? Who signs his ‘guru papers’ for him? 3 of the 11 “zonal gurus” he was supposedly challenging and reforming. Therefore, following this supposed “guru reform”, all of the original 11 gurus (not yet fallen) who had perpetrated a monstrous hoax on the whole society for nearly 10 years that caused the “guru reform” movement in the first place, got to keep their guru positions and disciples intact, were not sanctioned in any way whatsoever, and in exchange, the guru field was opened up to the supposed “reformers” such as RSD. And in this way the deal was cut, the “reformers” were bought-off by the zonal gurus, and everyone went home happy. the Hare Krsna movement would manifest world-transforming power. Here RSD turns completely on its head the common argument used against the ritvik system set up by Srila Prabhupada, that it is unprecedented and untraditional. Rather, RSD states that it is his guru system which ISKCON now follows which is unprecedented, created as it was through a system of “trial and error”, and further the whole system by which ISKCON is run via a GBC, is also not traditional. But the ritvik system which has a single acarya, Srila Prabhupada, is based on the traditional idea of leadership. Clearly therefore, according to RSD, if “tradition” is to be any yard-stick, it is his guru system which runs today in ISKCON which should be ditched, rather than the ritvik system.